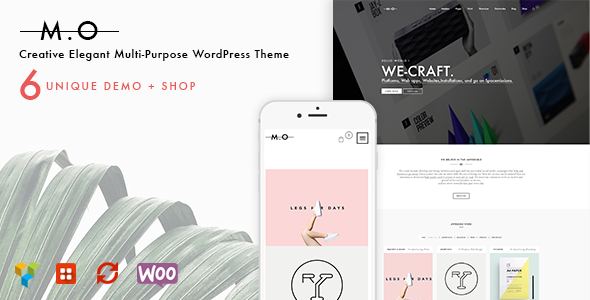 MO – is an super Elegant and UX WordPress theme which make you create awesome websites, The theme is hand coded with love so it is working smoothly and super easy to customize with one click import demo, many home layout design and tons of shortcodes. MO is suitable for Company, Agency and even personal blog or online shop websites. Admin panel allow you to quickly setup your website in the way you want it to look and feel with just some clicks. MO theme is not only working perfect on computer desktop and laptop but also display friendly and elegantly in almost every mobile devices like iphone, ipad, tablet, smart tv..etc. Forget the headache of install like demo, with ONE CLICK install demo function you can easy setup and import data and your website will look like demo in just one single click. Ecommecer function is a must have feature of our themes, with this function you can not only setup a professional website but also you can turn your website in to Ecommerce website with Woocommerce plugin completly FREE. Mo come with child theme ready so don’t modify parent theme, use child theme instead you will never worries about theme update etc. Icons font is a must have feature for website now aday, so we provide more than thousand icons for you to choose, this feature give you a flexibility to custom as your need. You can control the site and optimize it to be the top rated in search results and increase its potential visit. Use it as accent color you can choose any color you want for your website which match your brand. 5 BLOG TYPES, 5 POST FORMATS AVAILABLE. We use contact form 7 plugin for contact form, a Super easy and popular contact form. You get the theme with lifetime update that mean you can download update version whenever you want with ZERO fee. WPML is 100% compatible with our theme. We offer free support for all our buyers via support forum page, skype and email. Also MO come with a extensive documentation with HD how-to videos to help you get started with our theme. MO come with famous visual page builder, Visual Composer for WordPress is drag and drop frontend and backend page builder plugin that will save you tons of time working on the site content. No programming knowledge required! - Checked theme responsive & compatible on different devices and browwers. - Tweaked sliders after updating plugin. - Added option to to disable accent color ajax. - Compatibility Essential Grid plugin latest version.